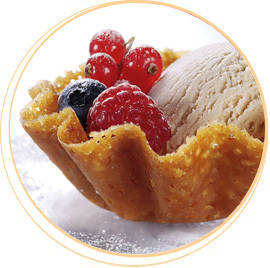 Our extensive range of premium fans, handmade baskets and crisp curls will dress and invigorate your dessert menu creating a premium look and feel. A classic favourite with distinctive flavour and crispy texture that adds a touch of elegance to your dessert menu. Hand crafted wafer baskets that melt in the mouth and enable you to create premium desserts easily and quickly. Crispy rolled wafers with a chocolate flavoured lining which add the finishing touch to any dessert, treat or coffee. Luxuriously crisp fans that turn simple desserts into something special. A great accompaniment to ice-creams, desserts and coffees.